It has been suggested that IBM zEnterprise System be merged into this article. (Discuss) Proposed since March 2019. A trio of IBM zEnterprise mainframe computers. From left to right: EC12, BC12, Bladecenter Extension. An IBM zEnterprise EC12 with the cover removed. The interior is lit to better see the various internal parts. 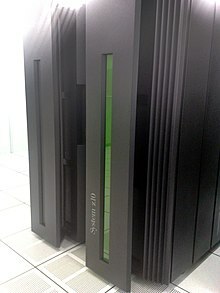 IBM Z is a family name used by IBM for all of its non-POWER mainframe computers from the Z900 on. In July 2017, with another generation of products, the official family was changed to IBM Z from IBM z Systems; the IBM Z family now includes the newest model the IBM z14, as well as the z13 (released under the IBM z Systems/IBM System z names), the IBM zEnterprise models (in common use the zEC12 and z196), the IBM System z10 models (in common use the z10 EC), the IBM System z9 models (in common use the z9EC) and IBM eServer zSeries models (in common use refers only to the z900 and z990 generations of mainframe). The zSeries, zEnterprise, System z and IBM Z families were named for their availability – z stands for zero downtime. The systems are built with spare components capable of hot failovers to ensure continuous operations. The IBM Z family maintains full backward compatibility. In effect, current systems are the direct, lineal descendants of System/360, announced in 1964, and the System/370 from the 1970s. Many applications written for these systems can still run unmodified on the newest IBM Z system over five decades later. Virtualization is required by default on IBM Z systems. First layer virtualization is provided by the Processor Resource and System Manager (PR/SM) to deploy one or more Logical Partitions (LPARs). Each LPAR supports a variety of operating systems. A hypervisor called z/VM can also be run as the second layer virtualization in LPARs to create as many virtual machines (VMs) as there are resources assigned to the LPARs to support them. The first layer of IBM Z virtualization (PR/SM) allows a z machine to run a limited number of LPARs (up to 80 on the IBM z13). These can be considered virtual "bare metal" servers because PR/SM allows CPUs to be dedicated to individual LPARs. z/VM LPARs allocated within PR/SM LPARs can run a very large number of virtual machines as long as there are adequate CPU, memory, and I/O resources configured with the system for the desired performance, capacity, and throughput. IBM Z's PR/SM and hardware attributes allow compute resources to be dynamically changed to meet workload demands. CPU and memory resources can be non-disruptively added to the system and dynamically assigned, recognized, and used by LPARs. I/O resources such as IP and SAN ports can also be added dynamically. They are virtualized and shared across all LPARs. The hardware component that provides this capability is called the Channel Subsystem. Each LPAR can be configured to either "see" or "not see" the virtualized I/O ports to establish desired "shareness" or isolation. This virtualization capability allows significant reduction in I/O resources because of its ability to share them and drive up utilization. PR/SM on IBM Z has earned Common Criteria Evaluation Assurance Level (EAL) 5+ security certification, and z/VM has earned Common Criteria EAL4+ certification. The KVM hypervisor from Linux has also been ported. Since the move away from the System/390 name, a number of IBM Z models have been released. These can be grouped into families with similar architectural characteristics. The IBM zEnterprise System (zEnterprise), announced in July 2010, with the z196 model, is designed to offer both mainframe and distributed server technologies in an integrated system. The zEnterprise System consists of three components. First is a System z server. Second is the IBM zEnterprise BladeCenter Extension (zBX). Last is the management layer, IBM zEnterprise Unified Resource Manager (zManager), which provides a single management view of zEnterprise resources. The zEnterprise is designed to extend mainframe capabilities – management efficiency, dynamic resource allocation, serviceability – to other systems and workloads running on AIX on POWER7, and Microsoft Windows or Linux on x86. The zEnterprise BladeCenter Extension (zBX) is an infrastructure component that hosts both general purpose blade servers and appliance-like workload optimizers which can all be managed as if they were a single mainframe. The zBX supports a private high speed internal network that connects it to the central processing complex, which reduces the need for networking hardware and provides inherently high security. The IBM zEnterprise Unified Resource Manager integrates the System z and zBX resources as a single virtualized system and provides unified and integrated management across the zEnterprise System. It can identify system bottlenecks or failures among disparate systems and if a failure occurs it can dynamically reallocate system resources to prevent or reduce application problems. The Unified Resource Manager provides energy monitoring and management, resource management, increased security, virtual networking, and information management from a single user interface. On April 8, 2014, in honor of the 50th anniversary of the System/360 mainframe, IBM announced the release of its first converged infrastructure solution based on mainframe technology. Dubbed the IBM Enterprise Cloud System, this new offering combines IBM mainframe hardware, software, and storage into a single system and is designed to compete with competitive offerings from VCE, HP, and Oracle. According to IBM, it is the most scalable Linux server available with support for up to 6,000 virtual machines in a single-footprint. In June 2014, IBM announced it had shipped its first Enterprise Cloud System to Vissensa, a UK-based managed service provider. 50% more performance and 70% more usable capacity. The new 4.4 GHz processor was designed to address CPU intensive workloads and support large scale server consolidation on the mainframe. Just-in-time capacity and management – monitoring of multiple systems based on Capacity Provisioning and Workload Manager (WLM) definitions. When the defined conditions are met, z/OS can suggest capacity changes for manual activation from a z/OS console, or the system can add or remove temporary capacity automatically and without operator intervention. More flexibility on the enterprise class servers in customizing and sizing the capacity of the general purpose processors (CPs) that reside in the server. The z9 EC servers offered four different sub-capacity settings when run with eight or fewer general purpose processors. zIIP engines. The zIIP is designed so that a program can work with z/OS to have all or a portion of its Service Request Block (SRB) dispatched work directed to the zIIP to help free up capacity on the general purpose processor which may make it available for use by other workloads running on the server. MIDAW. The Modified Indirect Data Address Word (MIDAW) facility offers an alternative facility for a channel program to be constructed. It is designed to improve performance for native FICON applications that use extended format datasets (including DB2 and VSAM) by helping to improve channel utilization, reduce channel overhead, and improve I/O response times. CP Assist for Cryptographic Functions (CPACF) is shipped on every CP and IFL processor in support of clear key encryption. CPACF was enhanced for System z9 processors to include support of the Advanced Encryption Standard (AES) for 128-bit keys, Secure Hash Algorithm-256 (SHA-256), CPACF offers DES, Triple DES and SHA-1. First zSeries Superscalar server (z990) – A superscalar processor allows concurrent execution of instructions by adding additional resources onto the microprocessor to achieve more parallelism by creating multiple pipelines, each working on its own set of instructions. A processor book is a modular card in IBM mainframes that contains processors, memory, and I/O connections. A multi-chip module is welded onto each processor book for the z196 model. ^ Selecting System z operating environments: Linux or z/OS? ^ "Mainframe strength: Continuing compatibility". z/OS basic skills information center. IBM. Retrieved 12 October 2012. ^ Bannan, Karen. "The zEnterprise EC12 Raises Enterprise Security While Boosting Analytics and Cloud Performance". IBM Systems Magazine. IBM. Retrieved 29 August 2014. ^ "z/VM Security and Integrity Resources". IBM. Retrieved 29 August 2014. ^ "IBM - KVM for IBM z Systems". IBM. Retrieved 14 March 2016. ^ "IBM unveils new cloud-ready mainframe based on single-frame design - IBM IT Infrastructure Blog". IBM IT Infrastructure Blog. 2018-04-10. Retrieved 2018-04-13. ^ IBM. "IBM Launches z13 Mainframe". IBM. IBM. Retrieved 20 April 2015. ^ "1.3 Introducing the zEnterprise System". IBM zEnterprise System Technical Introduction (PDF). IBM. August 2011. SG24-7832-01. Retrieved 16 April 2019. ^ "IBM's mainframe-blade hybrid to do Windows". The Register. Retrieved 12 October 2012. ^ "IBM Brings New Cloud Offerings, Research Projects and Pricing Plans to the Mainframe". IBM News Room. IBM. 8 April 2014. Retrieved 2014-07-18. ^ "IBM Enterprise Cloud System". IBM System z: Enterprise Cloud System. IBM. 8 April 2014. Retrieved 2014-07-18. ^ "IBM Brings New Cloud Offerings, Research Projects and Pricing Plans to the Mainframe". Enterprise Systems Media. 10 April 2014. Retrieved 2014-07-18. ^ Taft, Darryl (2014-06-27). "IBM Ships Its First Enterprise Cloud System to Vissensa". eWeek. Retrieved 2014-07-18. ^ "System functions and features". IBM System z10 Business Class Technical Overview. IBM. ^ "Multichip Module Packaging and Its Impact on Architecture" (PDF). ^ "IBM's z12 mainframe engine makes each clock count". The Register. Retrieved 14 April 2017. Wikimedia Commons has media related to IBM System z.